Baptist Health of Northeast Florida is the first local health system to go entirely paperless with a systemwide electronic medical record in Jacksonville, FL, and has long been a leader in clinical technologies. All 5 of our hospitals, our primary care offices, our pharmacies, home health and other services are now connected by one EMR platform, called SHIELD. Clinical technologies investments such as our digital imaging system and electronic medical records system have been Baptist Health’s focus for 10 years. With the Go-Live of the EMR at Baptist Downtown and Wolfson, we have realized a dream. Baptist Medical Center South opened in 2005 as one of the nation’s first all-digital hospitals, and the first in the Northeast Florida region. Baptist Medical Center Beaches and Baptist Medical Center Nassau followed, implementing EMR at their hospitals. By far the largest implementation, and most complex, was at Baptist Health’s flagship hospital, Baptist Medical Center Downtown, led by President Michael Mayo, and the region’s only pediatric referral center, Wolfson Children’s Hospital, led by President Michael Aubin. “We are excited to bring this new technology to all of Baptist Health, for the benefit of our patients, and to see this effort of so many years coming to fruition,” says John Wilbanks, chief operating officer of Baptist Health. 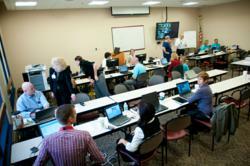 On February 25, 2012, Baptist Health became officially paperless systemwide. This date began what is called Stage 2 of EMR Go-Live for Baptist Health (Stage 1 last summer involved improving EMR functionalities at the community hospitals at South, Beaches and Nassau), which will last until April 27. Physicians and staff at Baptist Downtown and Wolfson Children’s Hospital continue to be supported around the clock for a period of time by SuperUsers (clinical staff who have extensive training and expertise in the new EMR), trainers, Information Services staff, and Clinical Effectiveness and Healthcare Informatics nurses (clinicians who have special training in clinical information technology). Baptist Health has long been a leader in information technology, and has been named twice to the InformationWeek 500 as one of the nation’s most innovative users of technology. In 2006, after the 2005 opening of Baptist South as one of the country’s first all-digital hospitals, Baptist Health’s Chief Information Officer Roland Garcia was named as a Premier 100 IT Leader by ComputerWorld. Recently, Garcia was named one of the Top 25 CIOs in the nation by InformationWeek for his leadership in implementing state-of-the-art clinical technologies throughout 1,044-bed Baptist Health, with five hospitals, a primary care network, pharmacies and other ancillary services.